The District Councils’ Network (DCN) is a cross-party member led network of 200 district councils. We are a Special Interest Group of the Local Government Association (LGA), and provide a single voice for district councils within the Local Government Association. District councils in England deliver 86 out of 137 essential local government services to over 22 million people – 40% of the population – and cover 68% of the country by area. As the housing and planning authorities, we approve 90% of all planning applications and enabled over 91,000 dwellings in our areas last year. 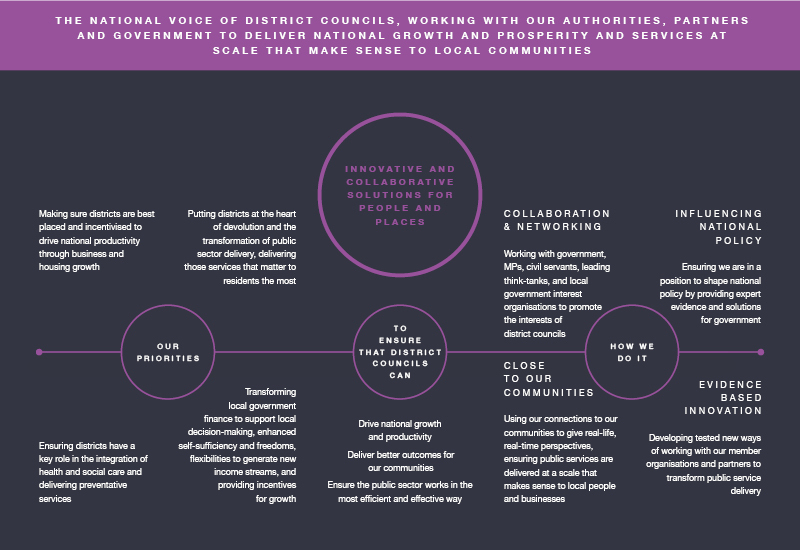 District councils have a proven track record of devising innovative solutions to transform public services, taking a lead role in improving services and outcomes for people and places through better collaboration. District councils have a proven track record of building better lives and bigger economies in the areas that they serve. Districts protect and enhance quality of life by safeguarding our environment, promoting public health and leisure, whilst creating attractive places to live, raise families and build a bigger economy. By tackling homelessness and promoting wellbeing, District councils ensure no one gets left behind by addressing the complex needs of today whilst attempting to prevent the social problems of tomorrow.